A few months ago, Amanda and I decided on a destination for our next exotic trip, Africa! I thought this would be a good start to a series of blog posts to detail the planning and preparation that goes into one of those once-in-a-lifetime trips. How do you plan for a trip to a place you know very little about? The timeline we’ve given ourselves is about a year to plan and save. I’m not saying we won’t go anywhere between now and then but we’ll keep it close to home, or at least in driving distance for a little while. The planning began in the place you go when you have any question; Google and the key words “Africa” and “safari”. The search found in 18 million results. Next up, sorting the good from the bad, the useful from the not-so-useful. It’s not an easy task, but we try to focus on travel-related sites we know and trust (like Frommer’s or Fodor’s). I usually then go to the place I trust for the most reliable information: a good, old-fashioned book. 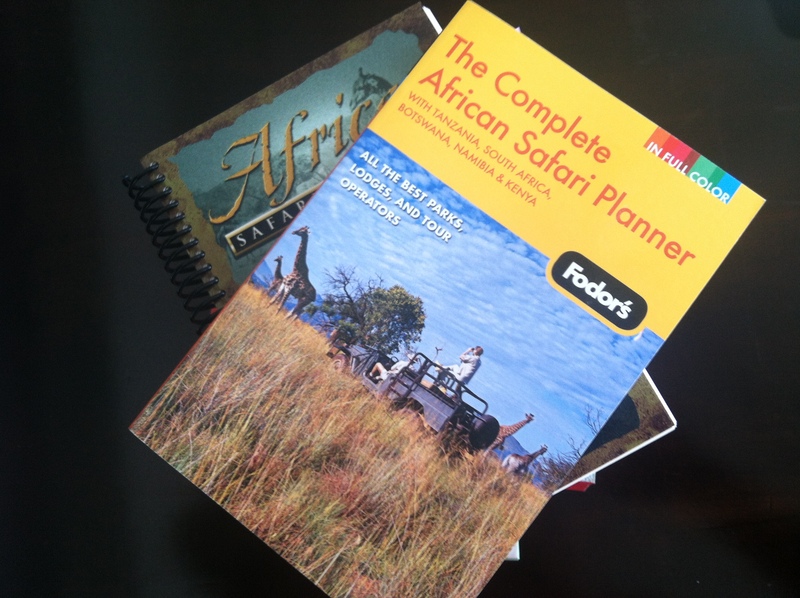 We headed to the bookstore (yes, they still exist) and found a copy of Fodor’s Complete African Safari Planner. It’s a thick book filled with color pictures and a good breakdown of the whats and wheres of safaris. We compared our list of needs and wants to what each country had to offer. We wanted to see lions, elephants, rhinoceros, zebras, basically the best the Serengeti has to offer. The place that seems to have the most of what we were looking for is Tanzania. Our next challenge is setting a budget. We knew planning a safari wasn’t going to be cheap, but had no idea how wide-ranging the prices and packages would be. There are purported “bargains” out there for about $1,500 per person excluding airfare (although we’re wary of the get-what-you-pay-for factor at that price point). There are also luxury packages full of spa services, personal chefs and five-star accommodations (yes, on safari) for a mere $14,000 per person. Here’s to finding a happy medium… or low-end-of-medium in our case!